If you're grilling or smoking meat, investing in a quality meat thermometer can protect your diners. Bacteria such as e Coli and salmonella can lead to conditions from diarrhea and vomiting to death. To avoid serving contaminated food, you need to confirm the proper internal temperature has been reached first using a meat thermometer. 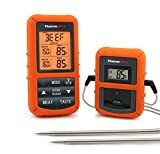 In this guide we will look at different types of meat thermometers including wireless, digital, leave-in, and instant read models in our comparison chart and meat thermometer reviews. Why Buy A Meat Thermometer? ThermoPro TP20 advertises their probes as being accurate to less than 2 degrees in either direction. Unlike other units, they stand behind this. The probe cable is 40" which is longer than other competing units and the probe reads temperatures up to 572F. Both the wires and probe are rated up to 716F which is great since they most likely will be resting on or close to your bbq or smoker. The wireless connection works out to a standard 300 ft.
ThermoPro has added a timer to the receiver. This is incredibly helpful at keeping all of the information associated with your cooking project in one place. Like the following Maverick thermometer, this unit comes with pre-programmed temperatures for a variety of meat profiles. You're free to replace them with whatever numbers work best for you. The alarm suite notifies you when the timer goes off or the temperature goes too high or low. The unit lights up in different colors depending on which condition it's responding to. The transmitter runs through batteries pretty quickly, even when it's not in use. You might want to consider picking up a set of rechargeable AAA's if you don’t have a set kicking around already. 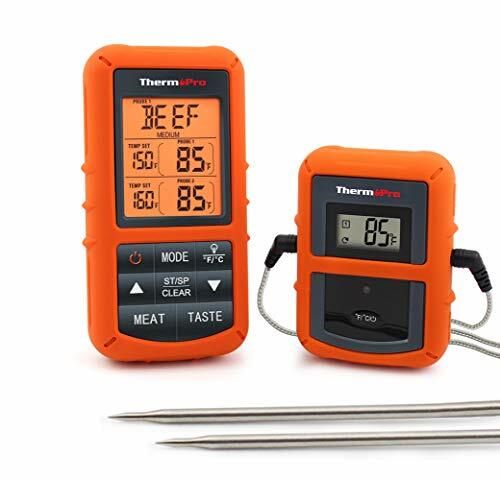 The ThermoPro TP20 might be considered to be one of the best meat thermometers because it meets or exceeds features by competing models and is topped with a warranty on their probe sensors. Maverick's wireless thermometer transmits temps up to 300 feet. The transmitter end plugs into two temperature probes with 3-foot wires. While some units have dedicated grill probes and meat probes, this one is set up to allow you to use either probe for either function. It has fully programmable presets and a memory bank with 15 types of food so you can easily reuse your favorite settings. The probes will perform at temps up to 700 degrees F, some 200 degrees higher than most of the competition, but read up to 572F. It's packed with the normal suite of alarms. This unit will alert you to high and low-temperature thresholds being exceeded and when losing signal from the transmitter. While the digital functions on this thermometer are cool once you've set them up, they're pretty unintuitive to figure out. The manual isn't much help here. Luckily, there's plenty of third-party help online when it comes to programming this thermometer. You may find yourself utilizing these resources again when it comes to syncing your receiver and transmitter. Again, once you've gotten that set up, everything should be a breeze. If you're willing to take a bit of time to learn how to set things up, the large display, long probe wires, and high-temperature tolerance make the Maverick ET-733 a solid contender for most barbecue and grilling needs. The Grill Grate ET732 features two probes, one designed for clipping to your grill or smoker and the other with a pointy end for inserting in meat. The probe wires are 30" and the probes themselves work up to about 710 Fahrenheit (although the unit won't read higher than 572F). The wireless transmitter broadcasts out to a range of 300 feet. Like the Maverick, this unit features the standard set of high and low temp alarms and a warning when it loses connection. Setting a temperature on the unit can be tedious, as each change of degree requires a few button presses. The probes on this unit tend to be a bit inaccurate. It could have more to do with bad probe placement than inaccurate sensors, but the issues are conflated by the wireless transmission model, which often results in outdated temperatures being displayed for lengthy periods of time. Is this the best thermometer for smokers​? As far as specifications go, the Ivation wireless thermometer is almost identical to the Grill Grate. It has 30" probe wires that can handle 716F while reporting up to 572F. The receiver works out to 300 feet and notifies you when it loses signal. You can set a custom temperature range and be alerted when either the meat probe or the grill probe reads too hot or too cold. The probes on this unit are accurate to within about 5 degrees. For most smoking and barbecuing this isn't too bad; you should still get great results within this variance. After a few runs with this unit you should be able to figure out what temperature setting works best for you. Setting temperatures can be a colossal hassle. It's unclear whether you can make the programmable temperature go DOWN other than by looping back around from the highest possible value. Since the temperature inches up slowly as you hold the buttons, you might want to give up when you're within a few degrees of the number you actually want. The case, buttons, display and functionality of the Ivation thermometer are practically indistinguishable from the Grill Grate thermometer. If you put tape over the branding you'd have a pretty hard time telling which was which. The biggest difference seems to be that you can get the Grill Grate in white or black, while the Ivation long range wireless thermomete﻿r is only available in white. For now, our verdict remains the same. It's functional, but unless it's the cheapest or easiest one for you to get, you may want to consider something with a different set of features. 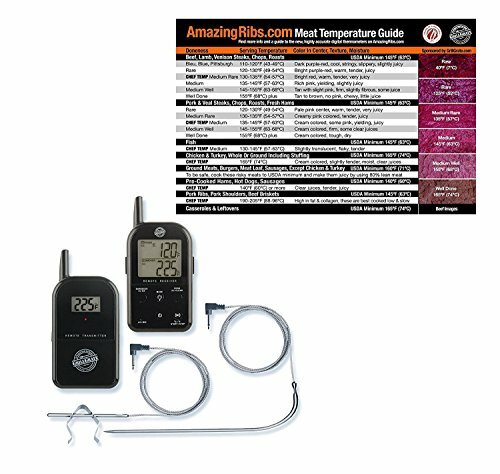 The Weber single-probe wireless thermometer has a range of 80 feet. This is 73% less range than any of the other units we have reviewed. While it lets you walk around the backyard or duck inside to grab tools without losing connectivity, you shouldn't trust this transmitter to work across the whole house or overcome serious wireless interference. The meat thermometer can withstand temperatures up to 482F, but it only reads up to 200F. This may be enough for most meats, but ribs, briskets, and other tough cuts are sometimes cooked to temperatures in excess of 200F. The alarm sounds when the "proper" internal temperature is reached, and the unit attempts to notify you when it thinks it is losing wireless connectivity. The largest issue with this thermometer is the way it's programmed. Rather than letting you decide how you want your meat to be cooked, this unit is set up with a bank of USDA presets. This makes setting the temperature very quick (you pick "hamburger" and it jumps right to 160) but very limited. You can't change these presets. Several types of meat only come with "well done" options. If you want a rare hamburger, you have to use the setting for a different meat. While this may not be the best digital meat thermometer, if you're comfortable lying to your thermometer and using the presets creatively, the Weber Style digital meat thermometer might be an adequate unit for you. 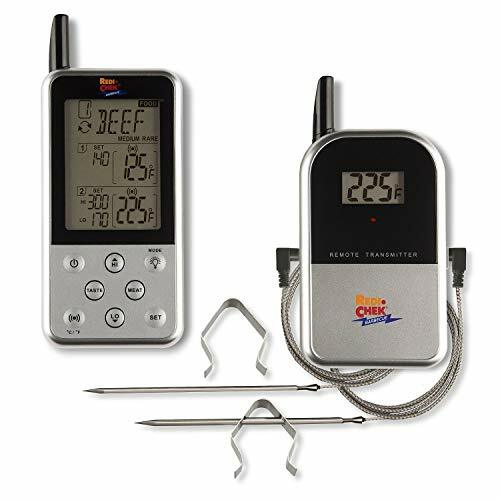 If steaks and chops are your favorite foods to grill, a dual probe meat thermometer can monitor your meat and your smoker or grill at the same time. 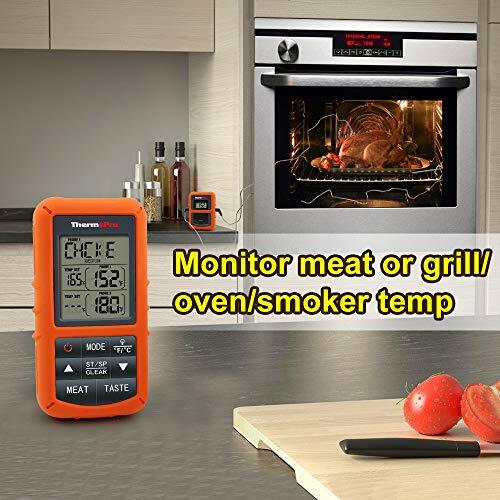 Many of these tools are programmable so you can pre-set your meat type such as pork chops or a beef steak, and monitor your meat temperature until it reaches a safe level. The probes on these tools are generally quite long and they can be left inside the meat. This may cost you a little juiciness when serving, but if it prevents food poisoning, it's worth it. 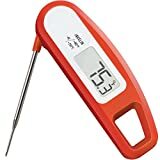 D﻿﻿ig﻿﻿ital instant-read thermometers can be used indoors or outside and can make preparing a new dish, such as lamb or your first turkey, a much simpler process. Many of these tools are built with mounting magnets, so you can hang the display and forget about it while the food cooks. Once you've selected your meat type and your desired temperature, your thermometer will let you know when you get there. If you need to maintain a specific temperature for a required amount of time to confirm the safety of the product, several of these tools have a timer feature as well. The stainless steel probes are easy to clean and store until your next grilling adventure. Some grilled foods, such as hot dogs, require a lot of tending. Others just need time to cook. Many wireless thermometers come with a remote sensor that you can take with you as you enjoy time with your guests. There's the probe and heat sensor that stay with the grill and monitor the temperature of your food. The wireless controller travels with you and gives you alerts when your programmed temperatures and times are met. It should be noted that the range on the wireless reader is limited; you can go about 300 feet with most of these units before you're out of range. Rather than dealing with a separate remote reader, a Bluetooth thermometer can let you know via phone when your steak is ready. The display on many of these is quite simple. To program or get detailed information, you'll need to refer to your phone for the most up to date data. The probes on these tools are generally designed to leave in the meat, so they're an excellent option for those with smokers or other closed systems. Because the ultimate goal of this purchase is to serve safe food, it's critical to purchase the right thermometer for your grilling set-up. It's impossible to tell by looking or touching; you need to pierce the surface and check the internal temperature. Solid red meats such as beef steaks and pork chops need to reach an internal temperature of 145 degrees Fahrenheit / 63 degrees Celsius. Ground meats and poultry products must reach 165 degrees Fahrenheit / 74 degrees Celsius to successfully kill bacteria that can linger in and on the flesh of the animal. If the majority of your grilling output is burgers and brats, an instant-read thermometer is an excellent way to confirm a safe temperature before you take the food off the fire. However, if your favorite grilling tool is a Pit Boss, you'll need a leave-in thermometer with external reading technology. While manual meat thermometers are fairly straightforward, digital tools take a bit more planning. The most critical decision is to invest in a meat thermometer that suits your grilling tool and preferred meats. 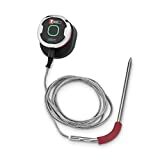 For an open top charcoal grill, a manual probe thermometer or simple digital reader will probably serve. The probes are generally stainless steel and should be handled as other food prep tools; that is, with soap and hot water. Because of delicate electronic sensors, these tools should not be considered dishwasher safe. Take care when cleaning your thermometer to wash and dry the flex lines that often run from probe to reader; this line may hold moisture which could lead to corrosion long term. Grilling is fun and exciting. Humans have long been fascinated with fire, and there is joy in cooking for friends and family. However, if you don't do your homework and cook safely, you can send people away sick. In addition to using a meat thermomete﻿r to reach the proper safe temperatures as noted by Food Safety experts, be certain to keep your food transferring tools separate and safe. Raw foods travel in one pan, cooked foods in another. Marinades must be boiled before they can be used as sauces.